In the picture that I posted of the Union 69 cal. 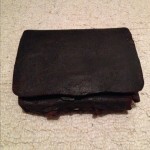 cartridge box that was found at the Perryville Ky.
Battlefield, I mentioned getting a 58 cal. 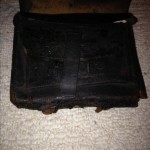 cartridge box that was also found on the same battlefield. This is it. It is always so neat to get an artifact that has been passed down through a family that has a great story to go with it. Although these are not in the best of shape, it is part of our history and always worth saving and sharing with others.